More of last winter’s offerings from Art F. A pair of fine Gitanes, the first an unidentified, the second a Grand Sport De Luxe. Hi Cameron, Art F here . I picked up a nice white Gitane at a thrift store recently cleaned it up and tuned it with new tires , cables, and brake pads. I replaced those horrible plastic Simplex derailleurs with some use shimano derailleurs which was a big improvement. It rode pretty nice and I sold it quickly. 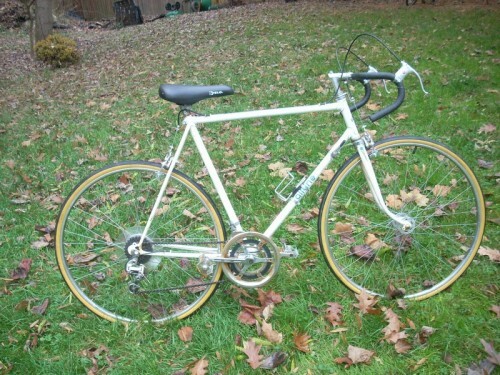 But what I can’t figure out about Gitane bicycle is how can you sell bicycles with no indication on the frame of what model this is and what year it was made. That’s almost as bad as the listings in the Washington DC craigslist with a subject Red bicycle $100 and then the text says” I’ve had this bike for a while but bought a new one . It rides nice but the tires are flat” Then maybe there is a fuzzy picture in dim light of a bicycle piled in the corner of a garage.YAAAGH . Anyway if someone can lead me to the decoder ring for Gitane bicycles , I’d be eternally grateful. 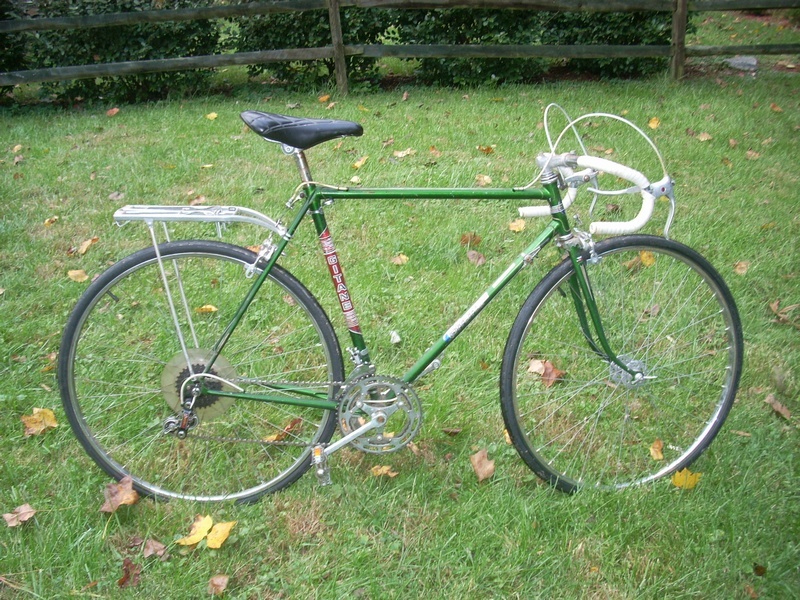 Gitane no 2 is Green and was labeled as a Grand Sport De Luxe . From my research I found out that this was a low end model . It gave me fits with the wingnut rear wheel attachment sliding out when hand tightened . Lost a sale when someone rode 10 feet and then tire rubbed against frame. After that I cranked down on wing nut with a pliers and told the buyer to carry a pliers with him in case he had a flat. This bike was a low profit one for me as I put on new tires , cables , front derailleur and brake pads and sold it for $100. I got it for frree because a local non profit that ships bicycles to Africa and south America decided it looked too bad to send overseas. I bet this bike is still tooling around DC in 10 years after I gave it the mini rebuild . Try snooping around at http://www.gitaneusa.com/. I have a special place in my heart for Gitanes, since my first OTS was one I bought new about 1971 as I was entering high school. I believe it was a Gran Sport Deluxe. It looked a lot like your green one. It was black, with steel cottered cranks, quick release hubs, and one of those black plastic Simplex rear derailers. It cost about $120 new. I’m not sure what happened to it. I still secretly hope it will turn up someday in one of the back corners of my parents attic, but I’ve always got my eye out for one as well. Nice finds. the one I fixed up might have had a Montgomery county license tag . 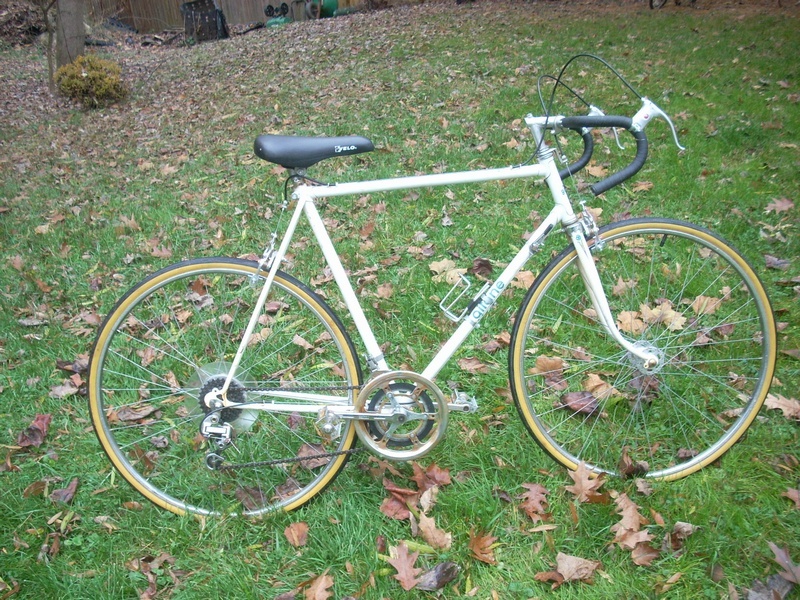 Wasn’t much rust and should still have had the rack and white bar tape and rear derailleur that’s not a simplex .